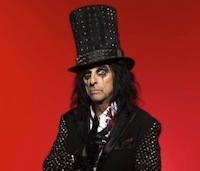 Rock star Alice Cooper found an Andy Warhol silkscreen that could be worth millions of dollars stashed away in his LA storage locker — which he forgot about for nearly 40 years, the Guardian reported. Cooper, 69, only remembered the print, “Little Electric Chair,” four years ago, while out at dinner with an art dealer friend, who talked about a different Warhol that fetched a pretty penny at auction. That jogged Cooper’s memory enough to go looking for his own masterpiece. “We went and found it rolled up in a tube,” Shep Gordon, Cooper’s longtime manager, told the site on Monday. Cooper’s girlfriend Cindy Lang paid $2,500 for the print to give the rocker for his birthday in 1974. But today, the piece could be worth a small fortune. In November, a green version of the same print sold for $11.6 million. Cooper’s may be worth a bit less, because it’s unsigned, according to art dealer Richard Polsky, who said the piece is the real McCoy. The silkscreen is based on a photograph of the Sing Sing prison death chamber where Ethel and Julius Rosenberg were executed, and is part of the pop artist’s Death and Disaster series. Cooper didn’t want to hang the print in his home, but may be coming around since hearing Polsky’s estimate of the value of the piece.